Before Justice, before Kanye, certainly before Lady Gaga, the rising popularity of a house music act in the US after 1990 was so unexpected, so novel, that Basement Jaxx were definitely in a class of their own—almost by elimination—when Remedy (1999) came along. It didn’t hurt that the debut had “instant classic” written all over it, plus a couple singles (“Red Alert” and “Bingo Bango”) destined for soft drink ads and MTV bumps galore. Not much to saying that the past decade has been an interesting ride for Basement Jaxx—and when we last heard from the duo, it was on the heels of their fourth album, Crazy Itch Radio (2006), which performed the essential task of re-introducing past bubblegum pop princess Robyn to the world, this time as a hipster dance diva. Other than that, it was hard to deny that Crazy Itch really wasn’t as crazy as it could have been, not, as far as being a tailor-made crossover success, up to snuff with the incredible trilogy of classics that preceded it. 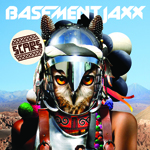 So, then, there’s a reputation to be remade with Scars—boy do Basement Jaxx know it. Every promotional piece of this puzzle suggests that Simon Ratcliffe and Felix Buxton are using Scars to get back to their roots, or at least back to Rooty (2001). The good news is that Scars is a stronger album than Crazy Itch Radio; the bad is simpler, that this is not another Remedy or Rooty, not when it adheres to the Kish Kash (2003) formula of stuffing the record with guest stars both good and bad. In other words, Scars bears only the easiest, maybe most ostentatious, marks of the past, forgetting at times what made the group so singular in the first place. “Raindrops” is the most refreshing piece here and the one cut that truly does sound like the old Jaxx, due in no small part to Buxton’s falsetto vocals, a hallmark move coming from this camp. Another go-to of those early successes was the use of lesser-known but soulfully freaky vocalists. By contrast, “My Turn,” off Scars, pairs an excellent bouncy beat from the duo with the crackly indie blahs from Lightspeed Champion. It’s not like a celebrity guest couldn’t work here, either—“My Turn” would make a great showcase for whatever Meshell Ndegeocello could muster, her rapport excellent with the Jaxx on Kish Kash. Likewise: as influential and brilliant as Yoko Ono is, her inability to budge at all from her usual vocal style leaves her with little room but to come off like an unwilling collaborator on “Day Of The Sunflowers (We March On).” It’s important to note, however, that unlike on Crazy Itch Radio, there’s not a dead groove to be served over the course of Scars; guest stars don’t always make a track, but it’s to the credit of Ratcliffe and Buxton that the stars can’t fully break one, either. Some of the guests are inspired fits, however, and contribute to making Scars the restatement of purpose that it is. Yo Majesty are obvious collaborative gold for the Jaxx’s strange, sometimes spasmodic beats, and “Twerk” does not disappoint, borrowing the lyrics from Michael Sembello’s “Maniac” to literal ends. “Twerk” also demonstrates Ratcliffe and Buxton in overflowing pastiche mode as a glut of different vocal snippets careen across the track; again it’s a Basement Jaxx signature, and again part of the reason Scars is so funky—check out those grunts and squeals over Santigold’s airy shouts on “Saga” (another feels-so-right pairing). Lisa Kekaula, a seasoned Jaxx vocalist, shows up for the surprisingly moving slow-jam “Stay Close,” a track imbued with some unexpected emotional breadth considering its primary responsibility to be a cozy, late-night groove. The weirdest thing about Scars is that, in the three years since Crazy Itch Radio, Basement Jaxx have moved from being anomalies ahead of the curve to sounding like another logical extension to a pop landscape populated by dance crossover stars. When even Diddy is looking to Parisian house for inspiration, there’s no longer as much of an underground feeling here; while a Basement Jaxx album used to feel like a below-the-radar party for real heads, Scars could easily soundtrack a celebrity bash. That’s not the Jaxx’s fault, of course, though capitulation suits them—trends just caught up with them, and, frankly, it’s impressive that it took nearly a decade for that to happen. In the meantime, here’s hoping that, regardless of where pop music goes next, Basement Jaxx could have another album this much fun in, say, another ten years.